This demo contains two sample surveillance video clips that were captured with the PIR-IR60 hidden infrared CCTV camera. The PIR-IR60 is a hidden infrared camera which means that it can be used in zero light, video surveillance applications and the IR LEDs do not have a red glow like a traditional infrared camera. This demo will show two video clips that were captured using an IR60. The first video was captured in an office with the lights on to demonstrate the daytime color mode of the camera. The second video clip was captured with all of the lights off in the room and the door closed to demonstrate the high quality, infrared mode of the camera in a zero light environment. As you can see when the camera goes into night mode, the picture turns black and white and the infrared LEDs turn on. Here is the daytime video mode one more time. Then the night time video mode once again. Being that the IR LEDs are undetectable and the camera is hidden as a motion detector, the IR60 makes for excellent use as a hidden spy camera. 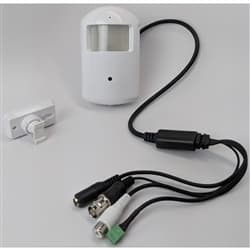 For more information on the PIR-IR60, please visit www.cctvcamerapros.com/ir60. Thank you for watching. Click here to learn more about the PIR-IR60 Hidden Infrared Camera used in this video.